RUSH: WNYC Radio New York (that's their PBS station), David Remnick, New Yorker Radio Hour, New Yorker magazine, talking to the conservative columnist for the New York Times, Ross Douthat. Now, I've never had his name pronounced. I'm pronouncing it as it looks. 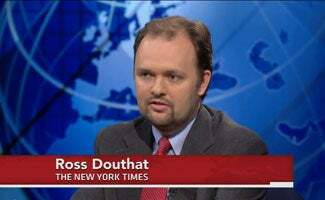 Is that what it is, Douthat? (interruption) Okay. So the subject matter is: How can conservatism reclaim itself? And to do it, it's got to get rid of me and Fox News. And since Douthat has apparently written about that, he's being interviewed by David Remnick -- big pro-Hillary, left-wing Democrat, or left-wing leftist -- and so here's the first bite. We've got two. REMNICK: (whispering) You have written pretty forcefully about the, eh, pervasive influence of right-wing talk radio and its influence on contemporary conservatism, which is far harsher, far -- far more filled with all the things that we associate with, uhhh, Rush Limbaugh and now F-Fox, sort of the harsher aspect of Fox, which are plenty. Um. (pause) How do you go about getting rid of that if that stuff makes you sick? REMNICK: How is the culture of conservatism gonna right itself? DOUTHAT: he way the culture of conservatism probably only can be fixed to some extent from the top down. I think the people who supported Trump were wrong, but I think their theory that you needed a strong president who could redefine conservatism was actually correct. The only way it fixes itself, I think, is from the top. DOUTHAT: Somebody gets elected who governs well and the party sort of conforms itself to their leadership. The figures we have right now, none of them have shown the capacity to be the leader that conservatism needs to be a good force for the common good in our society right now. RUSH: Yeah, what happened to that? I mean, the Republican primaries had 16 of them up there -- or 15 not counting Trump. I mean, all these Never Trumpers, they're the conservative leaders, they haven't led anything. I just wanted you to hear that, because you have made this program possible; so, therefore, you are also the problem. 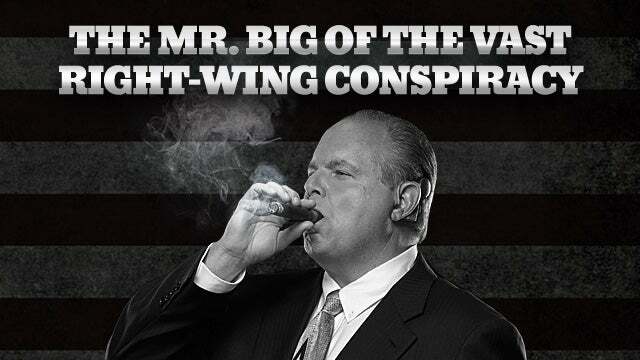 RUSH: Snerdley said, "Well, what is this guy's definition of conservatism?" It's a good question. The conservatism these guys are talking about is very subdued. It's admittedly minority, knows they're not gonna win but they exist in the margins to protect the guardrails to make sure the country doesn't go off the deep end. RUSH: My friends, it's one of these rare times when I wish I did have a microphone in there for the highly overpaid and rated staff. Snerdley has been going nuts ever since I played the two sound bites from David Remnick and Ross Douthat, that conservatism needs a strong president to rid the movement of the influence of me and talk radio and Fox News. Snerdley's in there, "What is his definition of conservatism?" That's actually a great question. What kind of conservatism are these guys talking about? Do you think David Remnick at the New Yorker is concerned about a conservatism that wins? Yes, he is. The reason he wants to get rid of talk radio and Fox News, are 'cause we're the only things that has seen to it that Republicans win. The other conservatives, take your pick of the other media conservatives in print, you know, the conservative intellectuals, what did they ever win? Nothing. They provided intellectual heft when it came to conservative ideology and this kind of thing, but they were typified by people who were expected to lose. I'm not gonna name any names. But I'm gonna tell you, when this show first started and I got to meet some of these people -- by the way, I don't want anybody to misinterpret my tone here. I don't dislike, I'm at odds with maybe a few, but most of them I have a good relationship with. But I'm telling you, when this was all new to me, I was just starting this program and we're ticking upward, and it's growing leaps and bounds, there's all kinds of excitement. And I'm asking some of these conservative intellectuals, "So when do you think, how long is it gonna take for us to triumph, become the majority?" And to a man they all said it was not possible. They didn't expect to. "I don't know, Rush. I don't think that's the objective, Rush." Okay. Maybe they're in the big scheme of things right; I don't know. But they didn't seem to even consider it possible. To me, it's no mystery why the left today and their media want to get rid of people like me and others who do this, and Fox News, because prior to us coming along, outside of Ronaldus Magnus, nobody won. The Republicans who won were certainly not conservative. They were maybe more conservative than the Democrats were, but they were still establishment types. You know the drill. And here's what it really boils down to. You know why they hate Trump. They think Trump is an ogre, he's impolite, he's rude, he's ill-mannered, he's thuggish, hoo hoo hoo. They don't want to be associated with it. And by the same token, they don't want to be associated with what they think is harsh, outspoken, maybe the humor is a little bit too ribald and so they want to be seen as very straight and narrow and buttoned down and reasonable and all of that. It doesn't surprise me that the editor of The New Yorker would be asking a conservative from the New York Times, how do we get rid of these people that are causing us trouble? How do we get rid of the people causing the Democrats trouble? That's really what the question means. Is it not? You think Remnick really worries whether conservatism is what it is or what it isn't? He's only worried about it to the extent that it is an obstacle the Democrats win. So he's asking the conservative columnist for the New York Times, what do we do about the people on your side that are causing us trouble? And the conservative columnist at the New York Times dutifully follows right along with the premise and gives him an answer. "Well, we need a strong president who's going to define conservatism the way we do, and then that will dictate what conservatism is." Well, hasn't that kind of been tried? Where is that conservative president? Where is he? Name one. After Ronaldus Magnus, name him. Who is it? They didn't think Bush redefined conservatism. They didn't think George H. W. Bush did. They didn't like Ted Cruz, and Ted Cruz could have been the guy who would have done it. They didn't want any part of Ted Cruz. I'm talking about these conservatives that we're talking about. Anyway, I just wanted to get those aired so you could get an idea of, I think, another sign that we are triumphing and another sign that we are prevailing. Because any time they want to get rid of their problems on our side, their problem is defined as we provide serious competition to them. They want to get rid of it. They'd rather conservatism by peopled by people that don't expect to win, who don't expect to dominate. Makes perfect sense to me.